It’s no secret that kids love unicorns, and many of us Solo Moms have spent our fair share of hours pretending to be mythical creatures. 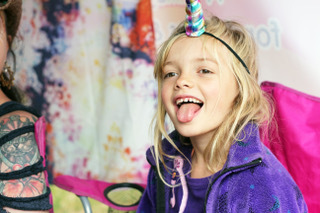 But Solo Mom Elliotte Bowerman took it one step further; together with her daughter, Liliana, Bowerman launched the Unicorn Scouts, a mail-order kit that encourages parents and kids to find their own inner unicorn (while having fun doing it together!). We sat down with Bowerman to talk about the Unicorn Scouts, how she balances starting a new business with being a Solo Mom, and what she wants other Solo Moms to know about running a small business. 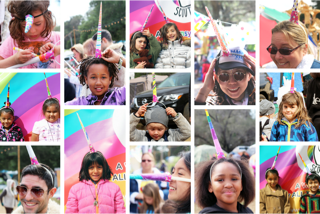 Q: What inspired you to create the Unicorn Scouts? A: My daughter and I have been unicorns for years, and we’ve been completing Unicorn Whimsy Missions, silly assignments that have us playing together immediately. When we started sharing them with our friends, and then out on the street and at festivals, it really lit people up and created so much fun. We decided to share that joy and the power of play as a way to connect, relax, increase creativity, and improve one’s overall health, so we created the Unicorn Scouts. Q: Describe the service to our readers. How does it work? A: Liliana and I just started the Unicorn Scouts this year, and we raised $10,471 via Kickstarter to help bring it to life. We’re preparing our first “Full Rainbow” kit to send out [to the Kickstarter backers]. Inside is a cape and horn, plus seven Unicorn Whimsy Missions. Each silly assignment—along with the supplies to complete it—is inside an envelope. So you don’t know what you’re going to do until you decide to open the envelope. Then you have to do it! This “secret mission” of whimsy (light, joyous play without pressure or points) is what starts activating families to play together in creative, silly ways. When parents can let their inner child out to play with their kids, magic happens. Q: What do you want kids to get from a Unicorn Scouts purchase? A: My hope is that parents who purchase Unicorn Scouts materials will enjoy them with their kids. So what I want families to get from the Unicorn Scouts is permission to play together, in simple, silly ways. I want them to see the magic in the mundane—to do the funky chicken while they brush their teeth, to make a leaning tower of pizza, to plant a fairy garden and sprinkle edible glitter on their mashed potatoes. 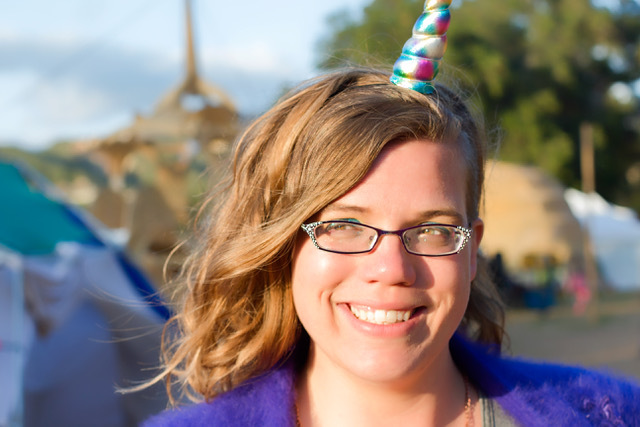 Q: How has launching the Unicorn Scouts affected your life as a Solo Mom? A: Being an entrepreneur can be intense. There are times when Liliana gets frustrated with the time required for me to manage all the moving parts. She’s our president of play, and she takes her role very seriously. It’s important. So we always make time to play, but it can’t always be exactly when she wants—and that’s tough sometimes. On the other hand, the Unicorn Scouts has enabled me to be a joyous parent again. I’m doing whimsy work I’m passionate about, and I get to share so much of the experience with Liliana. We’re creating a lifestyle business—one that enables us to be together more, to have more flexibility with time and location—and to get paid to play is pretty amazing. Q: How have you balanced starting a business with your role as a Solo Mom? A: I don’t think I have yet. During the Kickstarter month, I didn’t sleep much. That’s not really sustainable and didn’t allow me to be fully present when awake. We’re figuring out a lot of these things as we go, and of course there are new obstacles and opportunities. What I do know is that I’m compelled to keep going because it feels like entrepreneurship is the way I can be the mom I want to be. It’s stressful, especially in start-up mode as we bootstrap, but I get to decide my destiny. I create my own calendar, and I can show up for Liliana in ways I never could as a tech-marketing executive. I had to get out of the grind and get back into the glitter. I also know that although I’m a single mom without a coparent, I don’t feel like I’m solo in raising Liliana. That whole “it takes a village” saying is real and essential to all families, in whatever form they’re in. I’m supported by an incredible community—what I call our “heart family.” In the four years since we moved away from my biological family to be in the San Francisco Bay Area, I’ve invested a lot of my time and energy and love into building a network of close friends. Their kids are my daughter’s heart siblings and cousins. The adults have become aunties and uncles. I have a super unicorn roommate who fixes the toilet handle when it breaks off and mows the lawn. I still don’t get enough sleep, but I get far more time, connection, and joy. Q: What’s your advice for Solo Moms who have a business idea but are afraid to run with it? Start now. Take a tiny step toward making your idea real, even if that just means writing it down in a notebook. Then take another tiny step. And another. You can only climb a mountain one step at a time. Even if you inch forward—you’re moving! Talk about it—a lot. The more you speak your dreams, the more real they become. You can bounce ideas off friends and family. You can ask strangers in the coffee line. You can find digital communities to talk about what you want to achieve. Let yourself dream. Don’t listen to the voices that tell you to be practical, reasonable, or realistic—those are all forms of resistance. Your ego wants you to stay where you are. Even if your life feels like crap, it’s a familiar stink you know how to deal with. Change and growth freak that part of us out, so we’ll talk ourselves out of our dreams. We’ll listen to the fear because the unknown can be scary. But if you let yourself dream, if you get really specific about the shape and color and flavor of your vision, you start making it more real. Find a partner. I love my daughter, but she’s seven. She can’t balance the checkbook—yet. It’s great to get help. And if you’re solo, find a group of entrepreneurs. Join a mastermind. Start your own group. You aren’t alone unless you isolate yourself. Carve out small chunks of time. Wake up 30 minutes earlier or stay up 30 minutes later. Or watch 30 minutes less TV. Give that 30 minutes to your idea—every day. Q: How can we get our own Unicorn Scouts box?